I was hoping that these biscuits would be better than just using the canned biscuits. Unfortunately, they are 3 points each and the canned biscuits are 2 points each. I also thought that the wheat flour would boost the fiber content, but they only have 1 gram of fiber per biscuit. So much for healthier biscuits. They did taste good though, and they weren't hard to make. floured surface; knead gently 8 to 10 times. Roll to 3/4-in. thickness; cut with a 2-1/2-in. minutes or until lightly browned. Serve warm. Makes 10 biscuits. Thanks for visiting the sisters' cafe. I would love to try these biscuits. Especially since they look fluffy and not like hockey pucks. 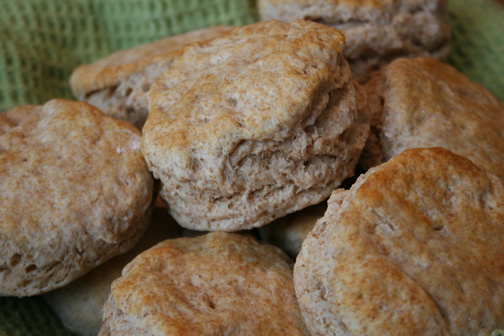 I tried a different whole wheat biscuit recipe once and ended up with hard little biscuits. Yours looks so much better!